Cael, blacked out in 2010. It has been said that a mother would know her child anywhere, and on an instinctive level I'm sure this is fact. But if you have small kids, or more specifically, if you have kids that behave like mine, you never know what you will see when you lay eyes on them each morning. There are always bumps and scrapes. If you're Cael, there is an endless string of self-induced black eyes. If you're Graham, your perpetual cold means red noses and cheeks popping up without warning. But lately they've both been changing their appearance in different but equally strange ways. Although Graham has never seen an episode of FRIENDS, he has begun near daily reenactments of Joey's "could I be wearing any more clothes?" scene by emerging for breakfast in four shirts and three pairs of pants. I get it. It's cold. And if I thought that multiple layers would make him more comfortable, I'd be all for it. But when he's so padded that he can't use the bathroom without assistance, I draw the line. And that line looks like a pair of size four carpenter jeans. Cael, on the other hand, can't get enough of his own skin. Maybe he's hot-blooded like his father, but given his penchant for decorating his own skin a la do-it-yourself prison tattoos, I think he's just in love with his own skin. I get it. He is very soft, and if I was that petite and looked so adorable sans clothes, I might be running around in my birthday suit, too. But alas, my neighbors' windows aren't that far away, and the problem isn't his nakedness. It's what he does with that cute skin when the clothes are off. 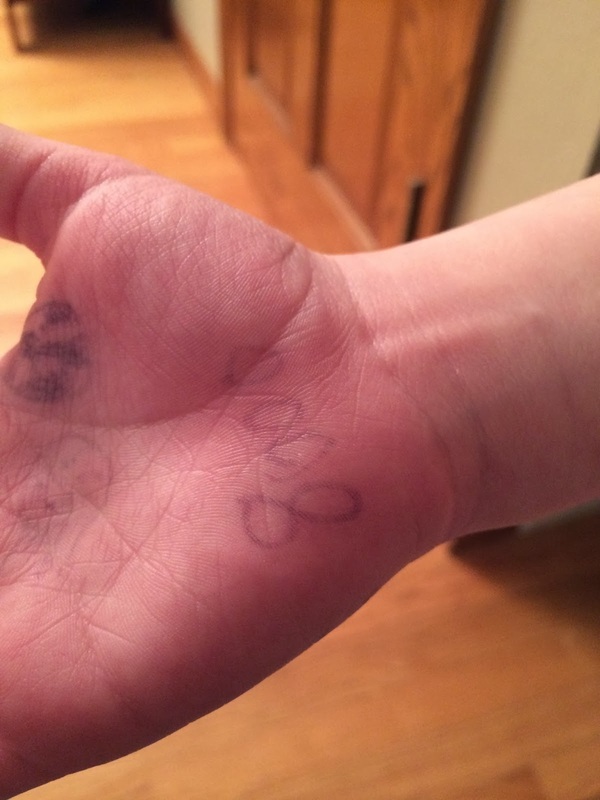 It started with a quick note on his hand. I didn't think much of it, because many people write quick reminders on their hands so they won't forget milk at the store or to pick up their dry cleaning. But when I ruled out a trip to the post office and any pressing grocery items (and when I remembered that his writing skills are still pretty primitive) I simply had to ask. "What's written on your hand, man?" "4,000 + 4,000 = 8,000." "Why did you write that on your hand?" I guess I can't argue with that. I remember when I thought $100 was enough to make a grown-up rich, so an equation pushing close to 10,000 must seem gargantuan to his brain. And if my kids are going to be changing their appearance, I guess I should be grateful they've both chosen something temporary and not too grand. There's nothing worse than a huge, garish display marring your child's beautiful body. "2+5 = 7", written from Cael's perspective. Then again, 7 is a pretty awesome number, too.